Since neither Mexico nor Congress is interested in paying for a border wall, Donald Trump has threatened to shut down the border between the U.S. and Mexico completely. Two of his top aides went on the Sunday talk shows to make it clear that he means it. Acting Chief of Staff Mick Mulvaney went on ABC to say it would take "something dramatic" for Trump to change his mind. Presidential advisor Kellyanne Conway went on Fox News to say Trump's threat is "certainly not a bluff." Both of them also said that Trump plans to cut off hundreds of millions of dollars worth of aid to Guatemala, Honduras, and El Salvador. Such drastic cuts to these very poor countries will make conditions in them much worse, causing more people to try to flee to the U.S., where they may encounter a closed border. This could cause huge problems for Mexico as the would-be immigrants from Central America get stuck on the Mexican side of the border. Of course, TV and radio pundits can afford to bloviate about such things without bothering to consider the consequences. The President, in theory, cannot. And what Trump may not realize is that Mexico is the United States' third biggest trading partner, with $611 billion in cross-border trade last year. For example, at Calexico East, CA, over 1,000 trucks cross the border every day. At Laredo, TX, 11 trains cross every day. If the closure also applies to goods and vehicles as well as people, commerce would be seriously disrupted almost instantly, with automakers and farmers feeling pain in the first week. However, if trucks and trains are let through, migrants will undoubtedly try to bribe their drivers and owners to smuggle them across the border. Once this starts happening, the Border Patrol will have to carefully inspect every vehicle crossing the border to look for stowaways. There aren't enough officers to do this thoroughly, which will lead to the worst of both worlds. The flow of goods will be seriously hampered and many people will still be able to sneak through. Medicaid work requirements: On Wednesday, Judge James Boasberg of the U.S. District Court for D.C. ruled against the administration's approval of work requirements in the Medicaid programs in Arkansas and Kentucky. Those states require able-bodied Medicaid recipients to work in order to get medical benefits. Boasberg ruled that the states and the administration did not consider the core requirements of the Medicaid program, namely, to provide health care to poor people. The ruling is sure to be appealed. Contraception mandate: The administration has issued a rule allowing employers to have health insurance plans that do not cover contraception, as required by the ACA. The administration has said that requiring employers who have a moral objection to contraception places an undue burden on them. A coalition of states sued the administration on this. The case is still in the courts. Association health plans: The administration has granted associations of small businesses authority to offer their employees cheap, stripped-down healthcare plans that do not offer all the benefits the ACA law requires them to have. This is basically an end run around the ACA. A coalition of 12 states sued the administration. D.C. District Judge John Bates blocked the administration on Thursday. The case is likely to be appealed. Short-term health plans: The administration is trying to lower health costs for people who don't plan on getting sick in various ways, including the associations described above. Another attempt is by permitting short-term health plans that don't cover much but are cheap. These plans allow insurers to refuse to insure people with pre-existing conditions. By banning sick people and offering minimal coverage, insurers can offer plans that are much cheaper than traditional insurance, but anyone who has one and gets seriously sick will soon discover they aren't worth much. Oral arguments in a case about the permissibility of these short-term plans is expected soon. The ACA itself: The most direct attack on the ACA is being led by a coalition of Republican state attorneys general who claim that since Congress has set the "tax" for not being insured at $0, the entire law is unconstitutional. A district court has already agreed with the Republicans and the case is on appeal. It is certain to end up in the Supreme Court, probably during the middle of the 2020 election campaign. A finding that the law is unconstitutional will mean that 20 million people will potentially lose their insurance, with all the political consequences of that. It could also backfire on the Republicans. If Democrats get control of the White House and Congress in 2020, after the ACA has been struck down, rather than try to revive a law the Supreme Court has said is unconstitutional, they could just give up on it and pass a Medicare-for-all law. It has been widely known for years that Joe Biden is a hands-on kind of guy. Maybe too much so. He has been accused by former Nevada assemblywoman Lucy Flores (D) of touching her and kissing the back of her head in 2014. She said the experience mortified, embarrassed, and confused her. Yesterday, Biden tried to weasel out of this one by saying that in his long career in politics, he had offered "countless handshakes, hugs, expressions of affection, support, and comfort, and not once—never—did I believe I acted inappropriately." He didn't actually deny the specific allegation but he sort of gave a generalized apology by saying if it happened, it wasn't his intention. He also touted his record on women's rights. Just because there has been an allegation, it doesn't mean it is true, of course. Henry Muñoz, a former finance chair for the Democratic National Committee, who organized the rally at which Biden allegedly kissed Flores' hair, said that the two were never alone together. On the other hand, Flores didn't say they were alone at the time of the incident, so Muñoz' defense of Biden isn't actually much of a defense. Already, some people are calling for Biden to withdraw from a race he hasn't even entered yet on account of a hair kiss. Among the loudest voices are folks on the right, who want Biden out, but are not calling for Donald Trump to resign from the presidency, even though the President has admitted to grabbing women by the pu**y and has been accused by more than a dozen women of much worse inappropriate behavior, including groping women and forcing his tongue into one woman's mouth. So, some of the anti-Biden voices are demonstrating quite the double standard. While it is not possible anymore for the minority party in the Senate to filibuster judicial nominations, the minority can still demand 30 hours of debate on each nominee, slowing the process to a crawl. This rule is one of the few tools the minority still has to prevent a president who has a Senate majority from ramming through judges without much vetting. Now, Senate Republicans are planning to change the rule to restrict debate on judges to only 2 hours. This will allow the Senate to confirm hundreds of Donald Trump's appointments to the judiciary very quickly, certainly well before 2021 and probably well before the 2020 general-election campaign, when it could become an issue. Democrats refer to this change as the "nuclear option." Those people who say that the country is hopelessly polarized and people never change their minds on political issues are wrong. In Dec. 2018, 71% of Republicans believed that special counsel Robert Mueller was on a witch hunt. Only 17% believed he was conducting a fair investigation. A new Washington Post/Schar School poll demonstrates that feelings have changed dramatically. Now, nearly 80% of Republicans are satisfied with AG William Barr's report that Mueller found no evidence of collusion between Donald Trump and the Russians in 2016. That's a shift of about 60 points in a couple of months. It's just possible, of course, that many Republicans were secretly afraid that Mueller was going to discover and expose many crimes that Donald Trump has committed, so they dealt with this by not believing Mueller. Now that he hasn't done this, they are suddenly OK with his work. The poll showed the reverse trend among Democrats. Pre-report, most of them had great faith in Mueller and now 53% are disappointed. Six in 10 Democrats do not accept his finding on whether Trump conspired with Russia. The long and the short of this is that people's faith in an investigation depends largely on what they think is going to come out of it. If something completely different comes out, their opinion of the investigation can turn on a dime. No, Google searches aren't biased towards Democrats. Nor does Google donate bundles of money to the blue team. Google's contribution is that it created a website translate.google.com that can make a half-baked translation from over 100 languages to over 100 languages. So if you ever have some text in Galician that you need translated into, say, Telugu, this is the site for you. The Democrats have discovered this website, so rather than have actual Latinos translate their websites into Spanish, some of the Democratic presidential candidates, including Sen. Amy Klobuchar (DFL-MN) and Julián Castro (who is an actual Latino, although he doesn't speak Spanish), just ran their websites through Google translate, and presto—gibberish (వికారమైన in Telugu). Politico had an actual Spanish speaking human being review the Spanish-language websites of the candidates and none were perfect. They ranged from having minor errors to being truly incomprehensible. Given how important the Latino vote is to Democrats, one might have thought that each candidate would have had at least one Latino outreach staff member who was a native Spanish speaker and who could have at least checked the output of Google Translate, or better yet, actually hand-translated the website into modern idiomatic Spanish for an American Latino audience. Spanish has dialects, and it is important to get that right. One of us (V) has written many books that have been translated into Spanish in Mexico by learned professors at Mexican universities. Then the books were translated again into Castilian Spanish in Spain, because Spaniards refuse to read Mexican Spanish. Translations done by an American-born native-Spanish-speaking staffer would get it right for an audience in, say, Miami, rather than in Madrid. From the above charts, one can see that partisanship varies strongly across sectors. In energy (think: oil companies), the Democrats are basically shut out. The best the Democrats have done in any sector is in telecommunications, where donations to both parties are equal, with almost half the companies trying to be neutral (the gray part in the middle). 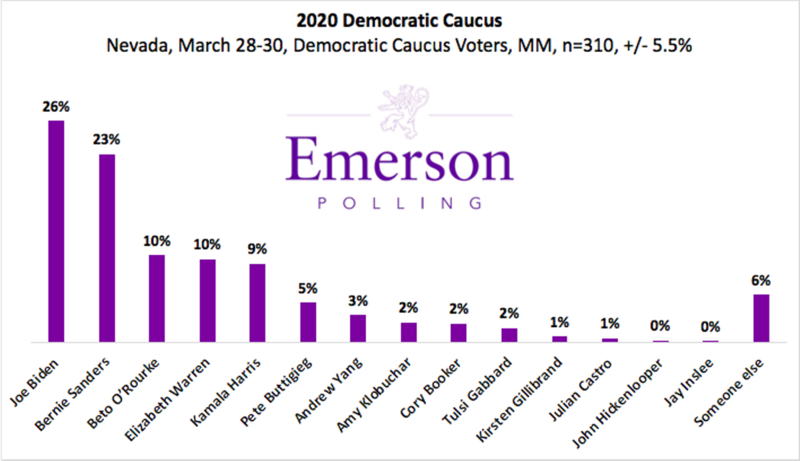 Emerson College has run a poll in Nevada of registered voters. As in its polls of Iowa and New Hampshire, Joe Biden and Sen. Bernie Sanders (I-VT) are by far the leaders. The top five also include Beto O'Rourke, and Sens. Elizabeth Warren (D-MA) and Kamala Harris (D-CA). Here are the full results. As usual, Sanders does great with the kids and Biden is strongest with the old folks. Among Latinos—an important group in Nevada—Biden is at 20%, Sanders is at 18%, O'Rourke is at 17%, and Warren is at 15%. As to the general election, Donald Trump is in relatively good shape. His approval is above water, with 49% approve and 44% disapprove. The only Democrat to beat him in the poll is Biden. The Democrats have a problem that the base wants a progressive candidate, yet the strongest general election candidates tend to be moderate. However, Biden has a specific problem that other moderates don't have: Anita Hill. About 38% of potential Democratic caucusgoers are slightly or significantly less likely to support Biden on account of how he treated Anita Hill at the confirmation hearings for Justice Clarence Thomas. Democrats need to win a net of three or four seats (depending on who becomes veep in 2021) to control the Senate. One of the seats that is crucial to their hopes of taking over the upper chamber is that of Sen. Joni Ernst (R-IA), who is facing an uphill battle through no fault of her own. Donald Trump's tariffs and the Chinese response to them have hurt Iowa's farmers badly and at town halls around the state Iowans are asking Ernst why she hasn't opposed Trump's tariff policies. Ernst also has the bad luck that Iowa's caucuses go first, as usual, so Democrats are practically camped out in the Hawkeye State, and many of them are smart enough to attack Trump on tariffs, thus keeping the subject on the front burner and Ernst on edge. This puts Ernst, who is otherwise popular in the state, in a bind. Trump's approval rating in Iowa is down 20 points since he took office and Ernst has supported him on almost everything, including his declaration of an emergency, so he could build a wall along the Mexican border. Her refusal to oppose Trump stands in contrast to her 2014 campaign image. State Auditor Rob Sand (D) recently said: "She sold herself as this Harley-wearing, gun-shooting, pig-castrating person who really would stand up and be tough and she hasn't been tough." Democrats are going to hit her for being all bark and no bite. One of these days, presumably sooner rather than later, AG Bill Barr will release some version of the Mueller report. At the moment, however, we are in the calm before the storm, and so most of the questions right now are non-Mueller-related. We'll start with the latter question, and note that gauging the impact of think tanks on the legislative process is a tricky business, for a number of reasons. One of those is because the line between "think tank" and "lobbyist" is often blurry (or non-existent). Another is because politicians have some motivation to hide the extent to which they "borrowed" from think tanks. As to the lack of a GOP healthcare plan, recall that getting more people insured might plausibly have been accomplished in three ways. The first was to get more people on the rolls of private insurers. The second was to expand the rolls of existing government programs, like Medicaid. And the third was to create a brand-new public health bureaucracy, much like the Brits did with the National Health Service after World War II. Looking at the options, the conservative Heritage Foundation concluded that far and away the most preferable for Republicans was the first option, and developed a universal healthcare plan consistent with that. This became the basis for the program implemented in Massachusetts under then-governor Mitt Romney. It was also the basis for Obamacare, with President Obama reasoning that he had campaigned on a promise of bipartisanship, and also concluding that since he was already pushing his luck with a universal healthcare plan, he better make it as non-socialist as was possible. Of course, GOP politicians rebelled against their own think tank's plan. This was as much a rebellion against the name on the plan, as it was the plan itself, as indicated by the fact that support has always been 10-15 points higher for the Affordable Care Act than for Obamacare, despite the fact that they are the same thing. The pushback against Obamacare/the ACA put the Republican Party into a bind. If they compel healthy people to buy insurance (which is necessary for the math to add up), then whatever free-market solution they come up with is going to look a lot like Obamacare, which they have savaged. If they try a free-market solution that lets healthy people opt out (or buy junk insurance) then the whole house of cards will collapse. And the alternatives to free-market solutions are going to be socialized, to a moderate or large extent, which is abhorrent to the GOP. So, the party has left itself with no good options to get behind. If the courts strike down the entire ACA and the Republicans are forced to come up with a plan, the most likely one is some form of Ryancare, advocated by the former house speaker Paul Ryan. In this plan, Medicare, Medicaid, and the ACA would be scrapped and replaced by "premium support." Recipients would be given a voucher for an amount to be determined by Congress, say $4,000 per person per year. They could then use this voucher to buy insurance on the largely unregulated free market, in which insurance companies could refuse to insure sick people, have limits on annual and lifetime payouts, etc. To handle sick people, there would be a high-risk pool that had to insure anyone who showed up, but there is a catch: The government would fund the high-risk pool with an annual appropriation from Congress, say, for example, $100 billion. People in the high-risk pool could submit claims to it and be paid—until the money ran out. If all the money was gone in July, people would be told to please come back in January. In many cases this might mean delaying treatment for months. Ryancare has two advantages for Republicans. First, there would be two insurance pools, one for healthy people and one for sick people. Since there would be competition for customers in the first pool, premiums would go down for most people, who would naturally be grateful and vote Republican. The sick people would probably vote Democratic anyway. Second, the total amount of spending the government does each year would be controlled by a single vote on the appropriation for the high-risk pool. Thus there would be no budget surprises if more people got sick than expected. Ryan did push this kind of plan for a while, but the reaction was awful, so he eventually dropped it. But if the Republicans were absolutely forced to come up with a plan, it would probably be some version of this one. You are correct. The GOP argument is that since the tax is zero, there is no tax anymore, and so the whole law is null and void. This is dubious, for a number of reasons. For example, the courts generally try to avoid striking down whole laws when it is only one provision that is objectionable. Similarly, as you point out, a future Congress could set the tax to some number that is not zero. Would that mean that the law was suddenly un-struck down? Courts are usually wary of laying the groundwork for this kind of strangeness. It's worth noting that the anti-ACA ruling came from Judge Reed O'Connor, a G. W. Bush appointee who is known for his right-wing interpretations of the law. And when he agreed that the zero tax meant that the law should be struck down, he was flayed by legal experts from across the spectrum. Most notably, Jonathan H. Adler and Abbe R. Gluck, who are on opposite sides of the ACA (Adler opposes it, Gluck supports it) joined together to write an op-ed in which they called O'Connor's ruling "lawless" and "an exercise in raw judicial power." So, the Trump administration certainly appears to have hitched its wagon to a dead horse. Whenever (Z) is asked about a second civil war, he always points out that the key to that conflict was not only that the nation became highly-polarized, but that the competing factions were geographically based. Red states vs. blue states aside, that isn't really true today, so another civil war is improbable. Also making it improbable is that the federal government commands vastly more firepower than private citizens do (something that was untrue during the original Civil War), and so would be able to crush whichever faction it decided was in the wrong. That means that we are left with two practical possibilities, now that Donald Trump (and some of the folks in Congress) have laid bare some of the serious weaknesses in the system: reform, or status quo. Generally speaking, Americans have been pretty good at fixing broken parts of the system eventually, though not always through constitutional amendments, and not always in a quick fashion. The most hopeful model would be the Gilded Age, which was also characterized by a lot of shady behavior from politicians (mostly in Congress, though, and not in the White House), and also by hyper-partisanship. That experience laid the groundwork for a number of major reforms, including voting by secret ballot, direct election of Senators, and the emergence of the majority and minority leader positions in the Senate. Of course, there are things about our era that are different from past eras, perhaps most obviously the existence of a media and online environment that allows the various factions to live in a bubble that constantly reinforces itself. So, we can never be certain past trends will hold until they actually do. There are a number of factors to consider here. Does the governor have the power to appoint people to various offices? How about veto power? And how extensive is that veto power (i.e., straight veto or line-item)? Does the governor play a role in setting the budget? And these things are not apples-to-apples comparisons, of course, so some folks might consider a governor with line-item power but no right to make appointments to be more powerful, while others might consider appointments to be more important than a line-item veto. That said, the scholar Thad Beyle tried to look at this systematically about 10 years ago. His chart is here, and is still basically valid, since gubernatorial powers don't change much over time. He has MA and NJ at the top of the list, trailed by AK, WV, and MD. The weakest governorships, by contrast, include CT, IN, RI, MS, AL, OK, and NC, with TX at the bottom of the list. You may notice that Southern states are particularly likely to have a weak governor. That is a product of their general, historical dislike of executive power. In addition, due to their general, historical dislike of government power in general, the Southern states have tended to take steps to weaken their legislatures (low salaries, limited meeting dates each year, etc.). Consequently, Southern state governments tend to be far and away the weakest overall, lagging far behind those in the rest of the country. They also tend to be the least effective, as judged by folks like Thad Beyle. Perhaps those two things are related. We hate to ruin anyone's fantasies. And since we are in uncharted territory, there's no way to answer this question with total precision. That said, there will certainly be no raid on the Oval Office by NY state cops. The USSS has operational priority in this case, and so the state cops would be forced to defer to them. What would likely happen, if New York does try to indict Trump, is that he would immediately file suit claiming immunity while he is in office. If and when he loses that suit, then he would be arraigned, and it's possible that might even be done in the Oval Office, as a practical matter. Wherever the arraignment took place, Trump would undoubtedly be granted bail, or—more probably—released on his own recognizance. And then he would be tried like any other white-collar criminal. The whole time, he would, of course, have Secret Service escorts. To some extent, the members of Congress are operating with the same understanding that everyone else is: Some members of Team Trump are loyal, some are less so, and it can be hard to tell which is which. A subpoena is a fairly aggressive move, and could put someone who is otherwise willing to be a friendly witness on the defensive. So, why not collect the low-hanging fruit before moving on to something more formal? The other problem with the subpoena is that if and when a Congressional subpoena is defied, the members are left with three options, two of them lousy. The first lousy option is that Congress can enforce its subpoenas itself, and can lock those who defy the subpoenas in the Capitol jail. However, this is messy and slow, and may not actually be legal. So, it hasn't been done this way since the 1920s. The second lousy option is to ask the executive branch to enforce the subpoena. Presumably the problems with that approach, under these circumstances, are self-evident. That leaves us with option number three: Go to federal court and ask them to enforce the subpoena. That request is more likely to be granted if Rep. Elijah Cummings (D-MD) or Rep. Jerry Nadler (D-NY), or Rep. Adam Schiff (D-CA) can say, "I tried everything else, including a friendly request, but it is now clear that a court-ordered appearance is the only option." We have actually noted this a couple of times: No, we don't think that the betting odds are especially accurate, for three reasons. The first is that they include the vigorish (a.k.a., the house cut), which throws the odds off some. The second is that bookmakers are leery of letting the odds get too extreme, for fear of taking a bath. There was a time when Donald Trump could surely have been a 250-to-1 (or worse) bet; imagine what would have happened if a few hundred people dropped 100 bucks on him at that number? The third problem is that people sometimes bet with their hearts rather than their heads, meaning that candidates who inspire particularly passionate support among a smaller number of people (say, Andrew Yang or Pete Buttigieg) are likely to have better odds than candidates who inspire moderately enthusiastic support among a large number of people (say, Amy Klobuchar or Kamala Harris), even if the latter candidates are actually more electable. One of us (Z) has made more than a few bucks betting against emotional favorites at Las Vegas sports books. Anyhow, we just added the odds because it's another (somewhat fun) data point, especially since polls are not particularly instructive right now. We expect to revisit the legitimate candidates at some point, and will probably replace the betting odds with polling results, which should be substantive enough at that point to be meaningful.